Five or six years ago I was serving the church in Canaan and the Canaan Church School took advantage of a warm day in September to climb Canaan mountain. It’s just on the east of Route 7 as you come into Canaan. There are higher mountains, obviously, like Mt Washington in New Hampshire and Mt Marcy in New York state and Mt Fuji in Japan. I’ve climbed all of them and all of them, I realize when I think about it, partly just for the challenge of it, but mostly, I think, for the view. So the Gospel today tells us about climbing a mountain and we could well ask why did Jesus climb mountains? Today’s story isn’t the first time or even the second time Matthew speaks of Jesus and a mountain. The last several weeks we’ve been reading the Sermon in the Mount and we’ll read about the first time – at least the first time we know about – in next week’s gospel. At the beginning of Jesus ministry, “the devil took him to a very high mountain and showed him all the kingdoms of the world and their splendor . . .” If you go to Israel they will show you that mountain. They call it “the mount of temptation” and it overlooks the Jordan Valley. You can’t begin to see “all the kingdoms of the world” from that point, but maybe far enough up and down the Jordan Valley to have a sense of power. At the very least, you could look down and see the tourists and the souvenir shops and feel above all that. From Canaan Mountain you can’t see “all the kingdoms of the world,” but you do see the village of Canaan in a whole new way: you see relationships between buildings in a way that you can’t from Main Street, and it all looks much smaller. I wonder whether part of the incentive to climb a mountain is that it gives you a sense of power because of that. You hold up your hand and it blots out the whole village. The Mount of Transfiguration may provide more of that sense of power. The experts disagree as to where it was. They showed us one in Galilee that is a spectacular mountain rising up out of the plain and giving you a commanding view of northern Israel. But some people – and I agree with them – think the mount of the Transfiguration was north of Israel and it is a really very high mountain with a view north into Lebanon and Syria. In Jesus’ day you could maybe see three or four kingdoms from there. But wherever it was, what was Jesus doing on this mountain of transfiguration? He did a lot of walking so he didn’t need the exercise. He didn’t need that change of perspective that makes the world below seem much smaller: he had rejected the desire for power long ago on that other mountain. And if you read the story carefully you realize that this time nothing is said about the view. In fact, the perspective in the story today is not down but up. Jesus is looking not toward human life but toward God. In the space age we no longer think of God as up and hell as down and so on, but our language still almost forces us to talk that way. The point is to transcend – to rise above – how else can you say it? The point of this story is certainly perspective – from this point Jesus has a road map that leads to Jerusalem and he gets that direction not from a calculation of the human factors – how many disciples do I need, how reliable are they, what will the Pharisees do – questions like that that you might mull over on a mountain top but from a renewed relationship with the source from which he came. Jesus came for a purpose. He goes toward that purpose. He can’t literally see Jerusalem from the mountain but figuratively it does come into view. From a mountain top you can see how the roads go and get a clearer sense of relationships and directions. The mountain provides a geographical perspective, and that’s useful. But it also provides a “purpose perspective” and that’s much more useful. We all need some sense of where we’re going, a sense of purpose: to get an education, get a family, get a job, get some security, see the children grow up, help the parish church carry out its mission, contribute to the community – all these are a part of the sense of direction that gives life purpose and meaning. And you get that sense of purpose best, I think, by looking up not down, not by reviewing the check book, or updating your resume, but in what the Prayer Book calls “returning and rest” – by withdrawal, by separation, from the perspective a mountaintop can give. Lent is a time to clarify these things. We stand here with a span of days leading up to Easter and we can make a plan for how to get there: what we need to do in planning our time, making sure we don’t have unnecessary baggage to carry. But no mountain Jesus could climb would show him the whole distance. Nor did he need to see it. The story says nothing about looking down. What he needed to get there was the certain knowledge that his will was one with God. What we need to get where we are called to go is not physical vision but spiritual sight: the certain knowledge that God has a purpose for our lives and that God will work that purpose out if we turn not to road maps or financial maps but to God’s purpose, God’s plan for our lives, which is not a rigid list of dos and don’ts but the freedom that comes from knowing our lives do have meaning and purpose; that there is a God who loves us and whose will is our good and who calls us to love others as we are loved. Isn’t that knowledge enough? Well, it is but I think we’re not always satisfied. We want to know more. Want to see beyond the curve of the earth and beyond the curve of space, to see into the future and know how things will come out. And no mountain top will let you see that, not physically. But it might let you find it spiritually. It might let you step away from all the ordinary, take-for-granted routines we all fall into and re-think who we are and where we are going and why. Jesus had a pretty clear sense of that from the beginning. Don’t you wish we did? Don’t you wish you knew how the war in Afghanistan will turn out? Wouldn’t you like to know whether this vast expenditure of lives and money will do any lasting good? But, you know, the Alcoholics Anonymous have a slogan we could all remember: Live one day at a time. One day at a time. A great 19th century Christian, John Henry Newman, wrote a hymn that says, “I do not ask to see the distant scene; one step enough for me.” And the reason we can live that way is because we know as Jesus did who shapes the future, who is able to bring good out of evil – even the disaster of Afghanistan – God can use all evil for good. Our lives sometimes get into situations that seem pretty hopeless; everything seems to go wrong; we don’t see a light at the end of the road. But what we need is a light right here, where we are, beside us, enough for today, not necessarily way ahead. 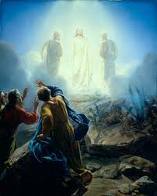 That light is what the Mount of Transfiguration is about: Jesus the light of the world is seen here just once in a visible light his disciples could understand and the voice of God makes clear who this Lord is and what their response needs to be: “This is my Son, the Beloved . . . listen to him!” I think we are like the disciples in wanting always more light than we need and more guidance than might be good for us. A child doesn’t grow, doesn’t mature, if we give them all the answers and tell them exactly what they should do. That cripples a child; it produces either robots or rebels. And that’s not what we want and it’s not what God wants. Lent is not about God giving us new directions and controlling our lives more tightly but about our coming more regularly and systematically to the light we need, step by step, along the way. Off there in the distance is Jerusalem. We don’t need to see it from here. We just need to know it’s there and God is able to give us the light we need to move down that road with the confidence that comes from knowing God is not simply ahead of us or above us but with us. Enjoy the view from the mountain. Once in a while it’s good to get away from the pressure of daily life and get some perspective. But then come down and walk with the confidence that comes from knowing God is our guide, God is with us, and God will enable us to find our way.